African White embroidery and Black long Dashiki Shirt. 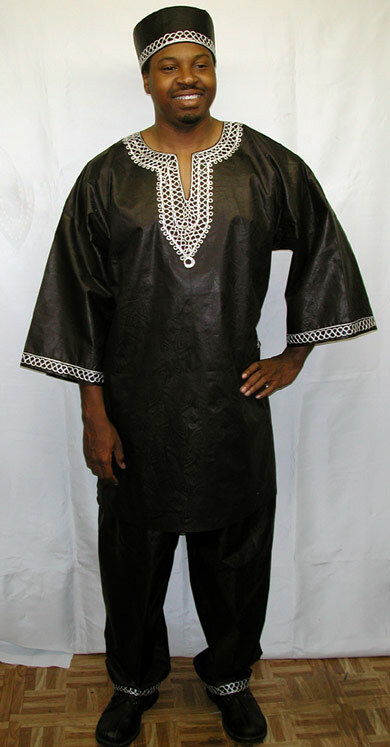 This consist of three individual pieces, dashiki (long shirt), pants and the kufi hat. These co-ordinated pieces are brilliantly embroidered in bright gold. Perfect for wedding and formal occasions. (Available in most colors: White, Cream or Off-White, Black, Purple, Blue and Beige with gold, white or silver embroidery and all sizes (Small - 4XLarge). Please add extra $25.00 for 2X - 4XLarge sizes. Made by Wilsdom Designs. Please select your dashiki size and color.